Minnie, Mack and Mario's Digest: Foam Isn't Only Found on Beer!!! Foam Isn't Only Found on Beer!!! 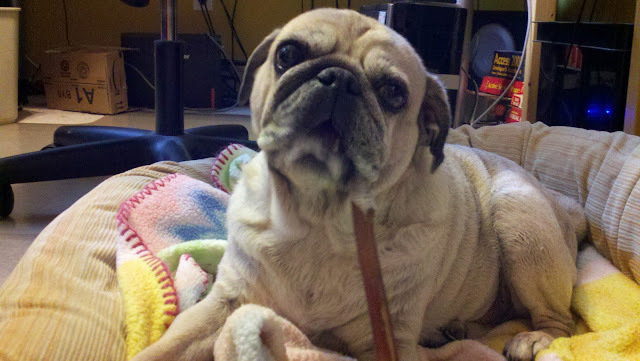 Today hu-mom gave Mack and me a bully stick since it was another dreary day outside. Pictures are better than words for this post. Hu-mom has never seen a dog foam up when enjoying a bully stick! Have you? Not only was the foam on the bully stick, it was also all over his lips and mouth! Payton, do you still want to kiss this?? He he he. Oh, Mack is still my cutie pie, foam and all! If he can stand my fish breath, I can certainly tolerate a bit of saliva. Hehee! But Minnie, like your hu-mom, I've never seen this before. Maybe this one was just extra good! I have never foamed over a bully stick, just can't get that whole "where they come from" thing out of my head long enough to foam up. But I do foam when I get really excited or upset. I have also foamed over brand new toys before. My guess is that Mack is totally enjoying that bully stick! I've never seen foam before. That bully stick sure must be yummy. ha ha ha he looks crazy! We love it! Oh my! Thats quite interesting. We never get good nummies like that cause is makes mommas tummy feel funny. Ohhhh Minnie! Sherman and Leroy are so proud of you!! YESSSSSSS! Nothing better than bully foam. Kitty gets super duper foamy when she fetches her tennis ball. Needless to say we don't play fetch very often because she gets cracked out. Bon appetit Mack! Mack is looking like a happy camper! Must've been extra good to deserve all that foam! BOL! Oh Minnie! Are you part Newfy??? OH MY Drooly!!! You are the cutest!!! We are hoping around bloggieville and wanted to stop and say hi! Looking forward to following you! What's a Bully Stick??!! Am I being deprived?? That's a lot of goo! Being two bassets we know all about foam and slober, too! RABIES! RABIES!! Minnie I would stay away from him if I was you. Oh yeaaaaaah. That just means it was SUPER EXTRA DELICIOUS!!!! Minnie the puggle, Mario the puggle and Mack the pug thank you for taking a moment to visit our blog! Minnie is 7 years old and Mack is 10 years old. Mario joined our family as a foster in March 2012. In December 2012 Mario became a permanent member of our family! Mario is 6 years old. We are joined by various kitties. We live in Northern Virginia.